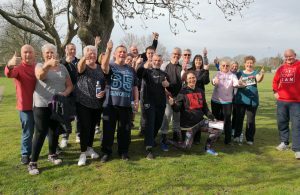 A free exercise class scheme launched by Hailsham Active in partnership with the Town Council and Our Parks/Fields In Trust, continues be of benefit to the local community and is celebrating one year of service inspiring people to become more active and improve their health into the bargain. Launched in April 2018, Hailsham Active has provided free and easy access to low-impact exercise for people of all ages. Since being awarded £5,000 funding by the London Marathon Charitable Trust as part of The Active Spaces programme delivered in partnership with Fields in Trust, Hailsham Town Council has worked with Hailsham Active and Our Parks/Fields In Trust to deliver and operate the Hailsham Active scheme. The group has grown during the past year and has launched new sessions at the James West Community Centre during the autumn and winter months, as well as Friday evening classes at Herstmonceux Surgery. Exercise sessions are scheduled to return at the Western Road recreation ground for the spring/summer period on Saturday mornings from 6th April (9am-10am), with additional classes opening soon at the recreation ground on Tuesday evenings (6.30pm-7.30pm). Session organisers are hoping to attract more than 30 participants at each class/session. If that wasn’t enough, further exercises classes are due to commence at Hailsham Country Park later in the Spring, following the Town Council’s successful bid for £5,000 worth of funding via the Active Spaces programme. “It’s fantastic news that the Town Council has been able to work with the local community to deliver and expand provision of free, easy access exercises classes in Hailsham,” said Deputy Town Clerk & Business Enterprise Manager Mickey Caira. Exercise classes commencing at Hailsham Country Park (details to be announced soon) will be completely free of charge for the next year.